Deirdre Kent, The Big Shift. I highly recommend this book to anyone concerned about the future. Even though it is a compact volume, it clearly articulates what the real problems are and suggests a two pronged approach to re-establishing the society we would all like to live in. Through the establishment of a local currency, complimentary to the national currency, leading to the re-establishment of the Commons, and with taxation based on land values rather than income, communities would thrive. With predictions from a number of sources that 2018 will be “a crunch time” for the global economy we won’t have long to wait before the insights in this little book will need to be applied. The information that another book, “The Natural Economic Order” by Silvio Gesell, was available as a PDF document, was also most valuable. It’s a very short book, 93 pages, and can easily be read in one morning if you don’t follow up on the many footnotes indicating useful backup information in books (some in LIFT) and online links. Most of it will be easily understood by the common reader with no background in economics, because it is full of real examples of failures and successes of various methods of managing economic systems. Unlike most books on the topic, the author presents on p.5 a summary of the book’s proposed new system, so you don’t have to plough through the background to reach the conclusions. Then you get the detailed proposals, with examples of past and present failures that cause the need for change, and successes proving the value of the suggestions. Climate change is one of the big risks the world faces, especially with the fossil fuel issue, bringing the need for action now in the economic world, if we want to successfully adapt to the next economic collapse. Buckminster Fuller is quoted: “You never change things by fighting the existing reality. 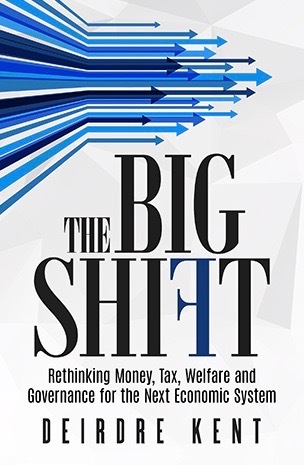 To change something, build a new model that makes the existing model obsolete.” This book’s new model will include a money system, a tax-and-dividend system and a partnership model of governance. “1. From bank-created money to a consciously designed and publicly created and controlled currency. 2. From ‘ownership’ of land and resources to sharing the values of the commons. Why should a reader who is not an economist read this book? And here in Lyttelton and greater Christchurch we already are stepping along the way of transition, for example with worker cooperatives, social enterprises, savings pools (and hopefully Christchurch dollars); in other parts of New Zealand other initiatives have been set up – land value rating (local tax) systems in Wellington and Napier, and a community land trust for Kotare village; and public banks rather than private have been hugely successful in the BRIC countries. 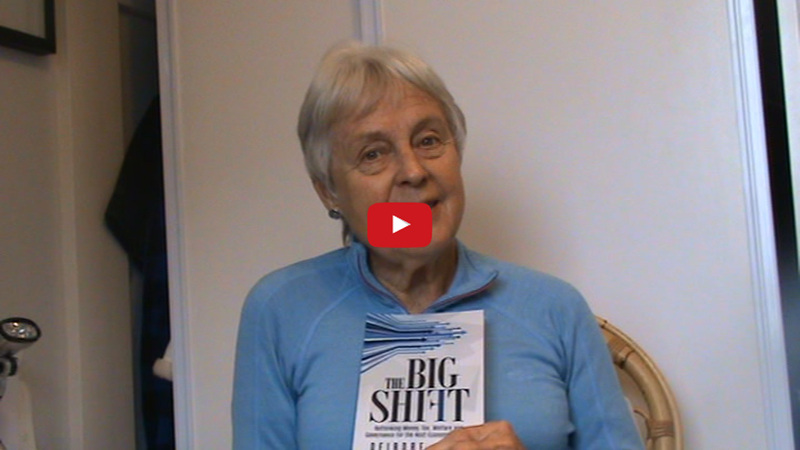 The book concludes with 20 brief statements of the positive results of this “BIG SHIFT”. My favourite is “No.2 – New life in industry, and a sea change in horticultural and agriculture methods.” But I applaud all of them!